Do we have rare species in Westborough? Seven animals and plants in Westborough are listed by the Mass Natural Heritage and Endangered Species program (NHESP) as endangered, threatened, or of special concern in Massachusetts. They are protected under the Massachusetts Endangered Species Act. Out of those seven, the blue-spotted salamander (Ambystoma laterale) has been officially observed most recently, in 2006. This 4-5 inch salamander is a species of “special concern” (SC) in Massachusetts. This label means that it’s a native species that has suffered a decline that could threaten the species if it continues. The label can also mean that the species occurs in such small numbers, in so few places, or in such a specialized habitat that it could easily become “threatened” in Massachusetts. In short, its situation could easily get worse. If it were to become “threatened” (T), that label would mean that it is likely to become “endangered” in Massachusetts, or that it is declining or rare. In turn, species that are “endangered” (E) are in danger of becoming extinct throughout all or part of their range, or are in danger of being wiped out in Massachusetts. Blue-spotted salamanders live year-round in the woods near vernal pools, which are landlocked woodland pools that fill with water in the spring but usually dry up by late summer. Vernal pools are vivid reminders of the glaciers that shaped New England’s landscape. Many vernal pools were created when buried blocks of ice left behind by retreating glaciers melted, leaving depressions in the ground, perhaps 9,000-11,000 years ago. Why do blue-spotted salamanders need vernal pools if they live in the woods? Like other amphibians (such as frogs), they have a phase of life that involves water. Blue-spotted salamanders hatch from eggs laid in vernal pools and grow up there, all in the few months when vernal pools contain water. Conveniently, fish don’t live in the disappearing waters of vernal pools, so the eggs and immature salamanders are safe from these would-be predators. Once blue-spotted salamanders have matured into their adult bodies, replacing gills with lungs and growing legs, they leave the pools for life on land. The adults live for many years and return to vernal pools only to breed, and then only for a few days in early spring – around this time of year. On the first warm, rainy night of spring – when temperatures hit the 40s – blue-spotted salamanders come up from underground burrows where they’ve spent the winter. They head for the vernal pools where they themselves hatched. About the same time, wood frogs and other salamanders that depend on vernal pools do the same thing. After mating and laying eggs, the adults return to the nearby woods. In other words, adult blue-spotted salamanders could probably do without vernal pools – if they didn’t breed. But what would that mean for future generations? The species needs vernal pools in order to continue. Vernal pools are the special place where blue-spotted salamanders breed. We rarely see blue-spotted salamanders, even when they’re on the move at this time of year. They’re active at night, for one thing. And they hide under rocks and logs and hunt earthworms and insects under the leaves on the ground. Their secretive habits help to protect their moist amphibian skin from drying out and to keep them safe from predators. When a predator – maybe an owl or heron, or a snake, shrew, or raccoon – attacks, blue-spotted salamanders often flee, but they also defend themselves with their tails. They brace themselves, stick their tail straight up in the air, and wave it around. At the same time, glands in the tail produce a sticky, white, foul-tasting substance. Like other salamanders, blue-spotted salamanders have a special ability to recover after an attack. If a predator chomps a blue-spotted salamander’s tail, for example, the injured salamander simply grows a replacement. Humans don’t grow new body parts, but researchers in the field of regenerative medicine are studying salamanders (as well as zebra fish) to find out how it’s done. They’ve found that cells near an injury first become less specialized – more like the stem cells we hear so much about these days. Then the cells specialize again in new ways needed to form the missing part. Researchers are looking for the genes involved. Many of the blue-spotted salamanders in our area aren’t pure blue-spotted salamanders. Instead, they’re hybrids (but they’re still protected in Massachusetts). We’re used to hearing about hybrids in plants, but not in animals (except perhaps for mules, which have donkeys as fathers and horses as mothers). The original blue-spotted salamander hybrids probably arose long ago, perhaps when the glaciers retreated. 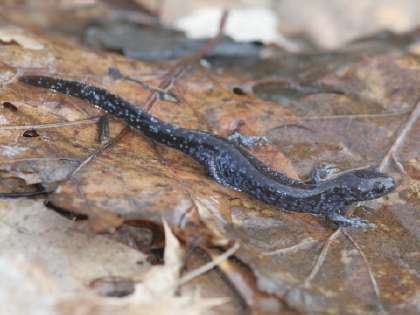 In most cases the parents were blue-spotted salamanders and Jefferson salamanders (Ambystoma jeffersonianum), which are now found in western Massachusetts but not in our area. Researchers are still unraveling the genetic story, but most of our local hybrids have two sets of genes from blue-spotted salamanders (just as humans have two sets of genes, one from each parent), plus a third set of Jefferson salamander genes. Some hybrids even have four or five sets of genes. And virtually all these hybrids are female. So how have they been reproducing since the time of the glaciers? As it happens, they need to mate with a male salamander – and in our area, that’s usually a pure blue-spotted salamander. But in most cases the male’s sperm simply stimulates the hybrid’s eggs to divide, without contributing genes to the hybrid’s offspring. The male blue-spotted salamanders that migrate to our vernal pools these days have plenty of females to court, including both pure blue-spotted females and hybrids. Apparently they tend to favor pure blue-spotted females, but not exclusively. We don’t need to visit faraway continents or watch nature shows on TV to discover rare, amazing creatures. We have them in our own backyard.